Another wave of action in Washington focused on K Street lobbying today. “Take Back the Capitol” protesters join local Occupy Encampments on K Street in Washington, DC. 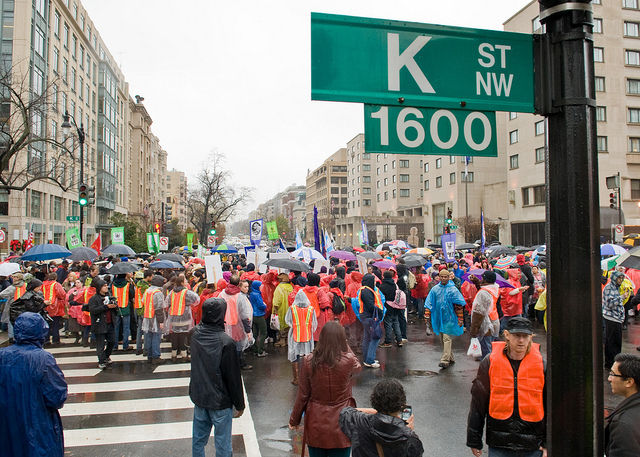 Photo courtesy SEIU. The second day of action for “Take Back the Capitol” focused on K Street lobbying Wednesday—and offered a chance for the labor-heavy, electorally focused “Take Back” protesters to mesh with the Occupy movements camping out in Washington, DC. Around noon, the “Take Back the Capitol” groups, which have been camping off the National Mall, headed towards K Street, where long-running Washington Occupy encampments joined them. They targeted in particular the Podesta Group, founded in 1988 by John and Tony Podesta. (John, of course, would later become Bill Clinton’s chief of staff and then head of the Center for American Progress). The goal quickly became to shut down the entire street, and there were between fifty and seventy arrests for blocking a public highway, according to the Washington Post. Tomorrow, “Take Back the Capitol” is marching on the White House, Congress and the Supreme Court, and there will be a prayer vigil for the unemployed on the National Mall. (You can see our recap of yesterday’s action inside Congressional offices here).